Hurricane last week, snow storm this week and the weatherman just said it will be upper 60s all of next week. What is going on New York? 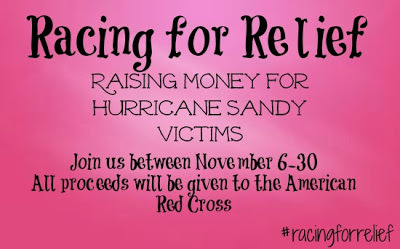 A little Racing for Relief update in just 48 hours we have raised a little over $300! I am amazed at how quickly and eagerly everyone has responded to this virtual race. My goal of $1,000 may even be surpassed by November 30th! Please keep spreading the word anyway you can. Yesterday I was off from work and got my booty to the gym for the first time since Saturday. 60 minutes of Kickboxing + weights has left my entire body sore today. I am happy to report, BOTH knees seem to be healed thanks to more rest days then usual. I guess that's the one positive thing that has come from the hurricane? After the gym I went to Target for ear warmers and more of my sugar cookie sleigh ride tea. Yep that cart =$100 of goodies. I bought non-perishable breakfasts and lunches for myself [still no power in the JKS household] they were out of my tea but I found a new one Candy Cane Lane and it is delicious! Confession of the day--I've never had Nutella before and after eating it I prefer the chocolate almond spread from Trader Joe's. I also picked up 2 long sleeved shirts [black & white] and a really pretty ivory & rose gold scarf. I had a mini debate with myself over buying it because it was $15, which isn't expensive but at the same time I didn't need it. Somehow the scarf won and it came home with me. After Target I got in the kitchen for a bit and made 4 batches of bagel chips. I watched half of the Voice before passing out for the night. All in all a successful day off. I agree, this weather is a little crazy, but definitely looking forward to the warm weekend!! I used to be a Nutella fanatic- a few weeks ago I tried that Trader Joe's chocolate spread- and it is indeed delish!!!!! I am hoping that you get some relief - it breaks my heart. I am going to be doing a fundraiser as well - We just should be able to do more.....sending warm hugs and love! I've never had the chocolate almond spread from TJ's! But I do have a love affair with Nutella every now and again. I'm glad to hear your knees are at least healing up with this rest. Keep on hanging! I hate it when I go into a store telling myself I only need one thing, but for some reason walk out $100 poorer. Ha Ha!